When Drew’s sister and her fiancé got engaged, I thought I would make them a wedding gift. A few months later, she asked me to be a bridesmaid so yes, I would definitely make them a gift! I planned on making a quilt about a year ago. I started a ton of research then but after I couldn’t find a suitable pattern or fabric collection, I let the idea go. A month ago, around the same time I was working on the Sparkle Dress, I found The Nomadic Tapestry by April Rhodes. I was simply looking at fabrics when this lovely little quilt crossed my eyes. 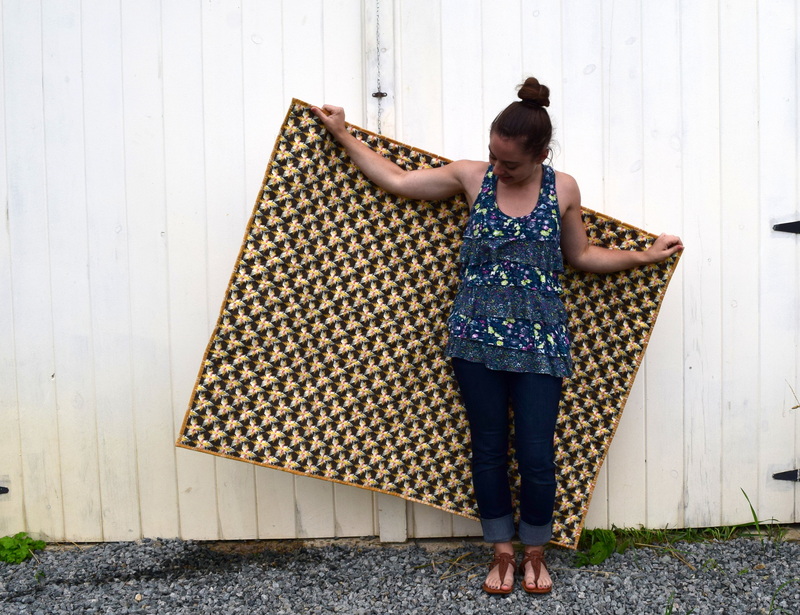 The size was smaller, like a lap quilt, the perfect size to take on picnics or hikes. The fabric, fun and stunning – colors of adventure! Which is perfect for them! That night I ordered the fabric. 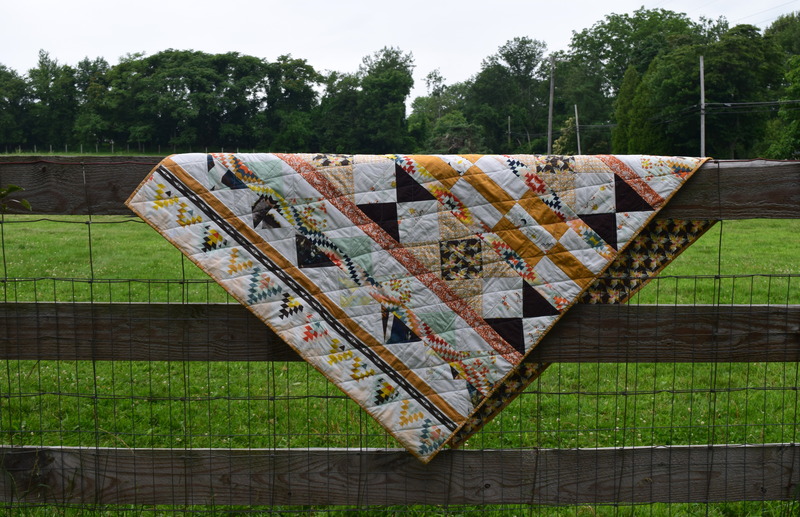 I had two weeks to make the quilt, and finished the hand binding just in time to take it to my parent’s farm for a photo shoot. Following April’s instructions, the project was a breeze. It was a very long process, but kind of calming. 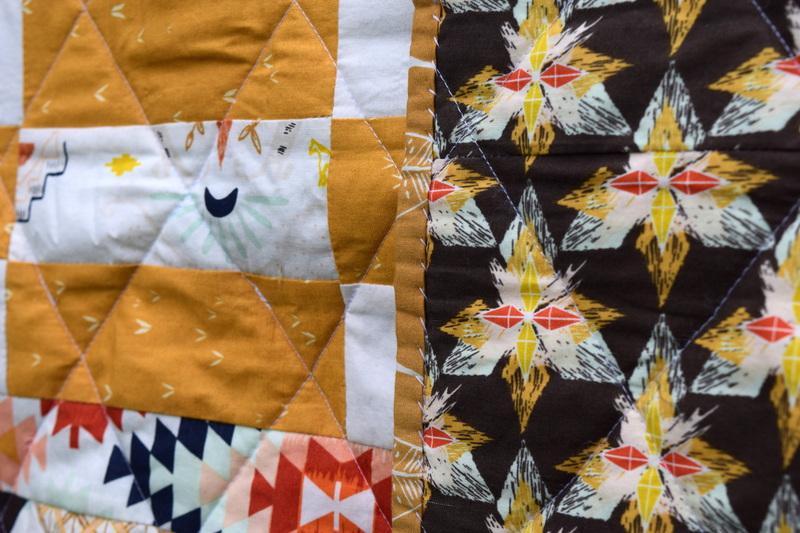 Quilting is really just straight seams and careful placement of fabrics… at least this quilt was. 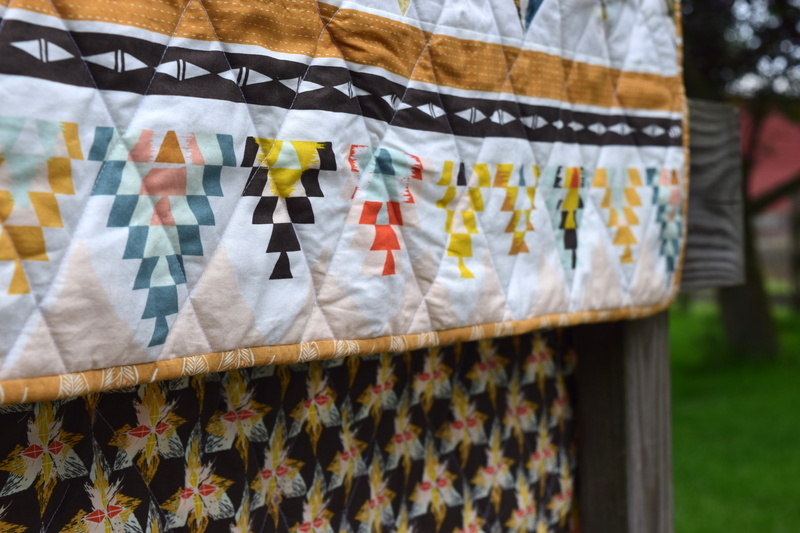 The actual quilting part was left up to the maker, as the pattern didn’t tell you how to do that. After a little google image searching, the easiest quilting pattern I knew I was capable of was diagonals (diamonds?). I don’t know if it’s a little too distracting from the fabrics, but I do like the result. I also had a few photo shoot interruptions, but I couldn’t be mad cause they were all so cute! 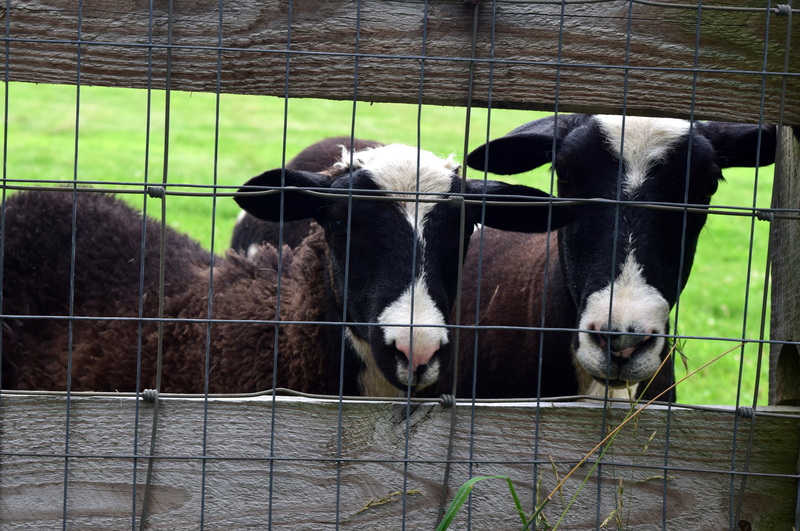 Although, I did have to run to take the quilt off the fence because I thought the sheep would eat it. 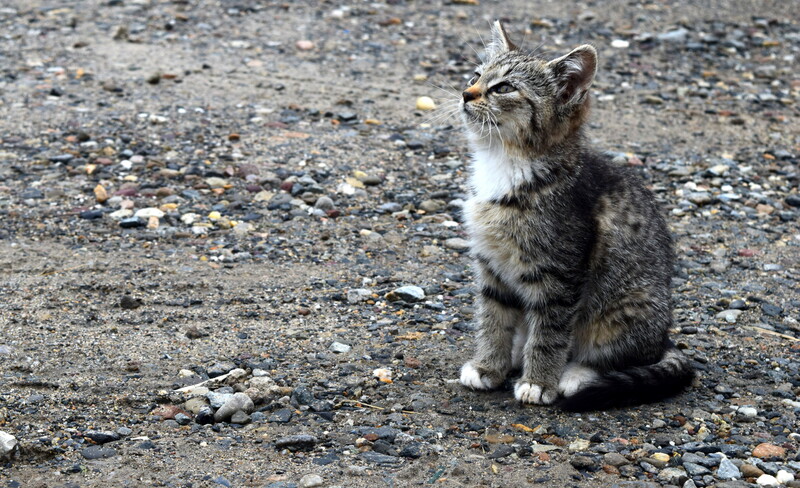 And the cat… well, who doesn’t want to see an adorable kitten? I’m happy this project came together and it is something I am proud to give to the couple! Their wedding is this Friday (thankfully neither follow my blog so I am able to share this before giving it) and I’m excited to be part of their special day! It is also the very first time I will get to see Drew in a bow tie and I can’t wait to see how freaking cute he looks! I have been wanting Drew to wear bow ties for years. I don’t know if I will make another quilt anytime soon. I didn’t have time to make my sister a quilt for her wedding, so when she starts popping out babies, I’ll make quilts for them. I really like quicker projects and apparel has more instant gratification. 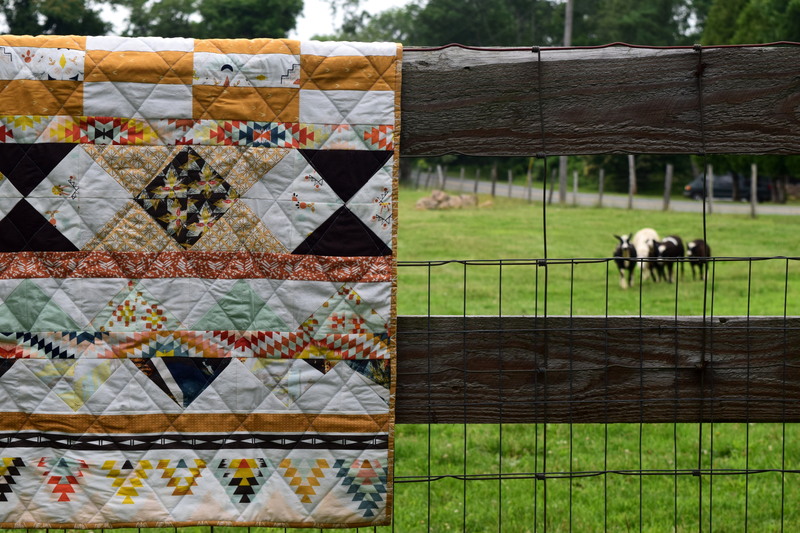 Have you tried quilting? Which do you like better, apparel or quilts? I’ve been wanting to try quilting for such a long time!! Maybe I’ll check out the pattern you used. The quilt looks great, I’m sure she’ll love it! The fabric is so colourful, too! Thanks Abigail! 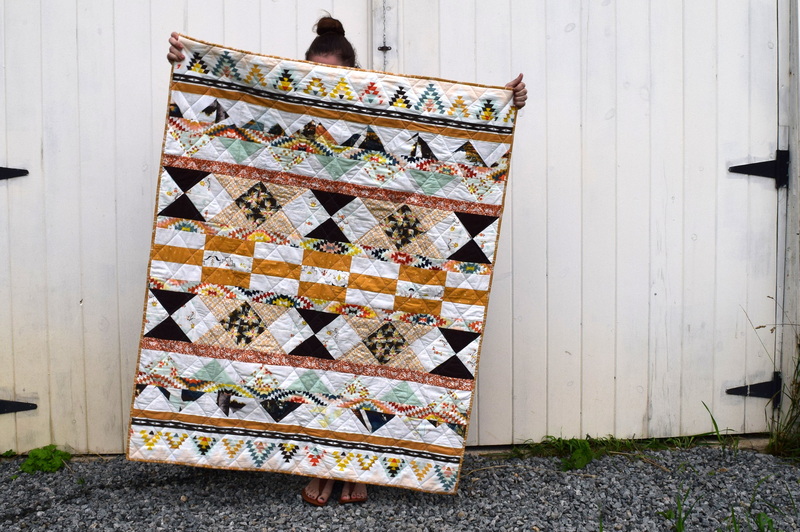 This was a great quilt to start with so very recommended! 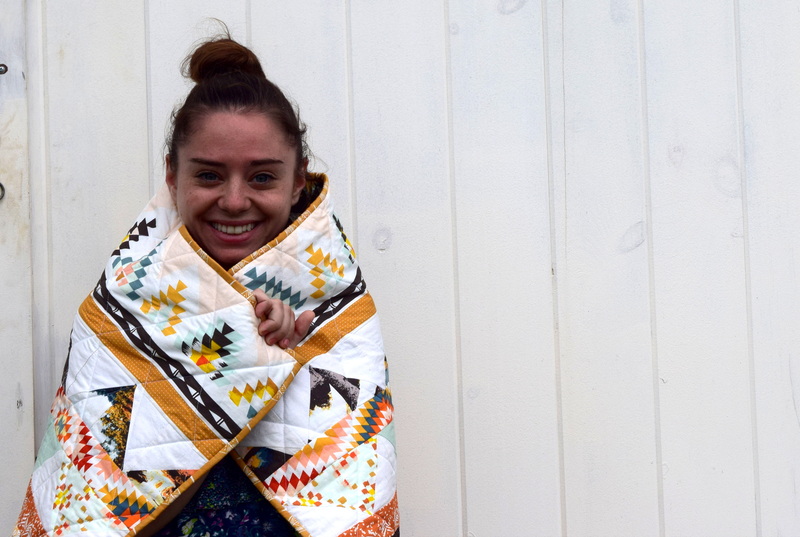 That is a beautiful gift and beautiful quilt! 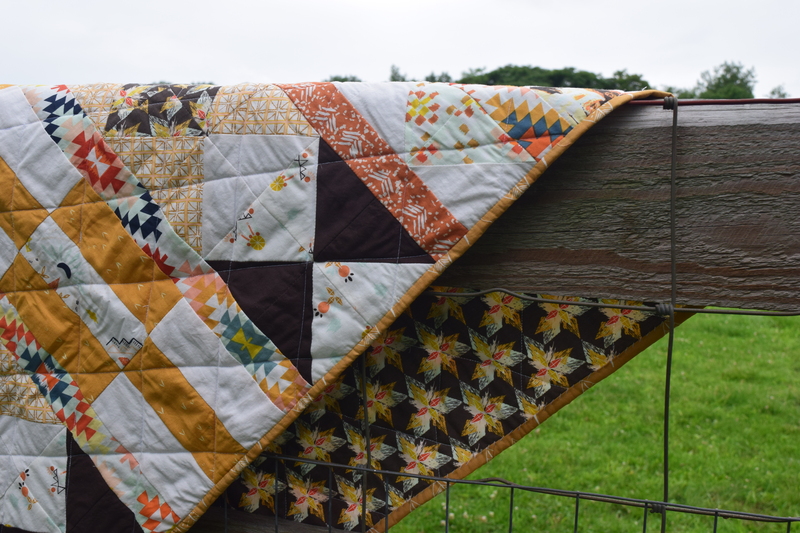 I have never quilted nor do I have any interest but I do love watching quilting shows and looking at quilts and you did a great job! As always you do amazing work and are such an inspiration! Thank you! I really didn’t have an interest in quilting before this because it looked way too complicated but I guess it just depends on the pattern used. I’ve never been to Kentucky but that does sound like an amazing place to see. I have so much more respect for the craft now! Thanks for the suggestion! Thanks!! Yea, that kitten just knows how cute it is haha! If I get any good shots from the wedding I’ll post! Thank you Lily! I hope so!! Thanks Brooke! I didn’t know about the kit, so thanks for the tip!